Tattoo Blog » Meet Durb Morrison! 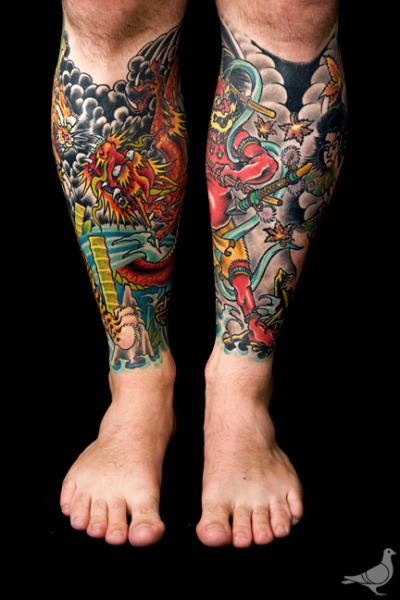 Tattoo Blog » Conventions » Meet Durb Morrison! Give it up for Durb Morrison. If aren’t familiar with Durb and the work that he does, then all I can say is that it’s time to learn. Quite simply legendary in the tattoo world, Morrison has done much to help tattooing and tattoos make the lengthy and often difficult transition into the mainstream. Many people are tempted to believe that it was tattoo artists like Kat Von D or Ami James who really provided the extra push needed to introduce the art form to a wider demographic. But beyond the cheesy reality TV shows and all the fanfare brought about by the growth of tattoo fame, Durb Morrison has been working hard behind the scenes to keep the art form that he loves thriving. The truth of the matter is that Durb Morrison is just plain badass. Currently 38-years-old, Morrison has been tattooing since the age of 17, although he didn’t actually begin tattooing professionally until the age of 18. Before that time, Morrison developed an interest in tattoos at the young age of 14. As a young punk, he went through the whole “home tattoo” phase, a period in which he and his friends began messing around with their mother’s sewing needles in an attempt to replicate the tattoos that they thought were so cool. While this perhaps wasn’t the best way to learn, it definitely was a way in which Morrison was able to get a glimpse of world that was filled with possibilities. In 1994, Durb opened his first tattoo studio in Columbus, Ohio, called Stained Skin. In 1999, he followed up Stained Skin with a Newark, Ohio studio called Second Skin. His life has thus far been absolutely filled with all things tattoo and tattoo related. He organizes and promotes the Hell City Tattoo Festival in Columbus, which takes place this May 21st-23rd (as I’ve mentioned many times before on this blog), and a tattoo convention that has become one of the biggest and most widely anticipated American tattoo festivals/conventions currently going. He’s tattooed musicians, designed album covers for musicians, is a regular contributor for Tattoo Magazine, has created a tattoo application for the iPhone, owns his own publishing company (Pint Size Publishing) and…did I mention that he’s also a very gifted tattoo artist? Now I’ve said a lot, but I don’t really feel like I’ve said anything about Durb Morrison. He’s so prolific and such a talented artist that it’s probably better for me to just stop now and tell you to go here. As I previously said: give it up for Durb Morrison. He just might be the hardest working man in the tattoo biz.